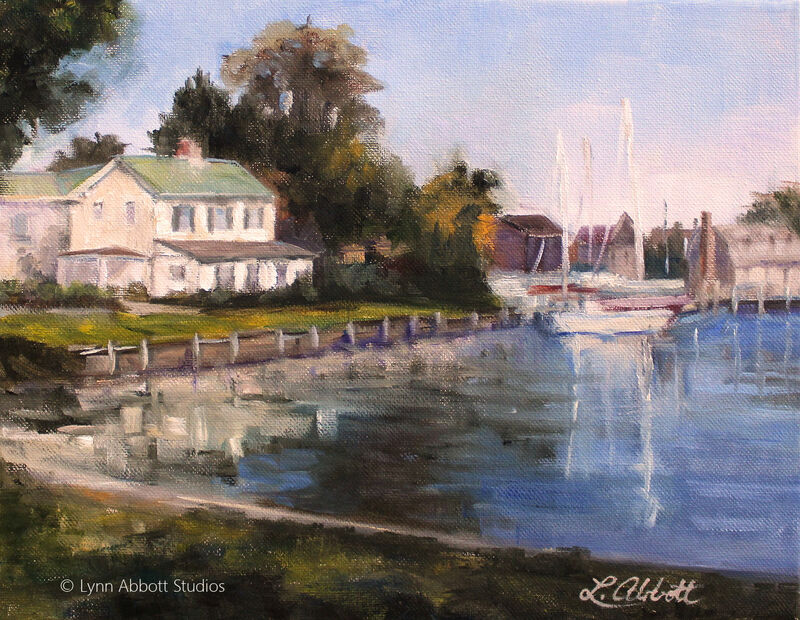 “Safe Harbor in St. Michaels, Maryland,” © Lynn Abbott Studios. Used with Permission. My youth pastor did more than teach scripture; he found creative incentives to encourage its memorization. That is how I found myself floating behind a ski boat in the San Diego Bay on a ninety degree day in late August. And it showed. I lost grip of the rope whenever the boat pulled. Of course, my sense of humor invariably carries me through difficulties. Thus, after swallowing more than my share of bay water, I emerged…laughing and sputtering. That, of course, only made things worse. Yup. Nothing ever comes easy for me. Quite honestly, I suspect that even wildly successful people must work hard. From what I’ve observed, talent or interest only gets you a place behind the boat. It takes a lot of hard work to learn to stand. Or even ski around the bay. I’ve been reminded this week as I watched the Olympics that even if you have been called to do something, the road may prove extremely difficult… So much work. And quite honestly, I don’t much like that part. I prefer watching the Olympic games from my easy chair. I long to return to the safe harbor. Perhaps, you’ve been there, too. It isn’t uncommon. Even Moses questioned when his dreams didn’t immediately materialize. Of course, Moses appeared perfectly placed to lead God’s people out of Egypt. Raised by Pharaoh’s daughter, educated by the finest Egyptian scholars, Moses had everything going for him. But talent and position alone did not get him very far. In fact, relying on his own abilities, Moses made a bit of a mess and became a fugitive from Egyptian justice, (Exodus 2:15). That’s right. He overestimated his ability to affect change. The young Moses had yet to learn that most anything of value requires hard work. Perseverance is a necessity in the face of inevitable storms. And God blesses faithfulness, (Psalm 31:23). But Mo’ had yet to learn that. So, God sent him to the wilderness to learn a little of humility and hard work. In Midian, then, Moses learned to persevere. No glory. No more rich rewards in Pharaoh’s court. Moses worked hard as a shepherd to provide for his family. Life at court became a distant memory. Yet, God did not forget Moses. God spoke to Mo through a burning bush. First response? Moses worshiped. A good start. But then, Moses tried to wiggle out of God’s call. The former Prince of Egypt gave God a great many excuses. From what I’ve observed, talent or interest only gets you a place behind the boat. Really, when I reread the account, it seems that Moses still lacked God’s perspective. Although Moses had learned much about hard work, he still depended solely upon his talent to carry him. And that had obviously proved an epic fail. He’d been forced to run for his life. Moses’ faulty perspective becomes apparent in his arguments–they won’t believe me; I’m not a good speaker, (Exodus 3-4). Although he had acquired humility, he still believed that position, rank and natural talent were primary. He had not considered God as part of the equation. God, however, graciously met each of Moses’ objections with a demonstration of God’s power. Then, God promised, “Certainly I will be with you,” (Exodus 3:12). But it wasn’t easy street. Even Mo’s journey to Egypt proved a bit rocky. Although Moses understood God’s covenant with Abraham as marked by circumcision, his wife evidently opposed obedience to God’s command. In Exodus 4, we read of the resulting conflict between Moses and his wife, Zipporah. But God’s chosen man had to fully identify with God’s people, and ultimately, Zipporah gave way. To say she was angry would be an understatement. That’s right. Moses had barely sailed out of the harbor when he encountered mutiny at home. Scheduling an interview with Pharaoh was probably easy by comparison. After all, Moses had been educated in Egypt. He knew the ropes at court. At least, Mo finally understood that God would direct his path. He no longer rested in his own strength, but delivered God’s message to Pharoah. Since he’d finally “learned his lesson,” it would seem the former prince should find success. . .
Time for some smooth sailing. But, in fact, the wind and waves had just begun to swirl. I return to this simple truth: even though I respond to God’s call, I am not guaranteed calm waters. Pharaoh answered, “Who is the LORD that I should obey His voice to let Israel go? I do not know the LORD, and besides, I will not let Israel go,” (Exodus 5:2). Right. That certainly didn’t go as Moses had hoped. So Mo’ pulled out all the stops. He gave God all he had. No holding back. However, Pharaoh not only refused to let Israel go, he also punished the people for Moses’ request, (Exodus 5:6-9). Moses questioned, “‘O LORD, why hast Thou brought harm to this people? Why didst Thou ever send me?” (Exodus 5:22). Yeah. What about that? How come doing God’s will only seemed to make things worse? You see, God has a greater purpose. God’s plan often includes both the powerful demonstration of God’s glory as well as the development of my faith. That certainly proved true for Moses. Again and again, Pharaoh threw obstacles in Israel’s path. With each roadblock, Yahweh miraculously demonstrated His power. Israeli freedom did not come by Egyptian favor. Nor did it come because of Moses’ demonstrated talent or education. Nevertheless, because Moses obediently persevered, God dramatically exhibited His power on behalf of His people. And you and I now read of the ten plagues and the parting of the Red Sea. The journey isn’t easy. And even though we follow God’s call, we may encounter storms. Through it all, God builds our faith and ultimately rewards our perseverance. Yup. God uses every part of our journey–including our “flubs”– to bring about a miraculous transformation.